If your special occasion calls for brown shoes, we have a lovely selection of evening shoes in wonderful tones of chocolate brown for you here. 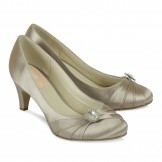 On occasions we have known a bride to accessorise with brown shoes too, and brown looks simply stunning with ivory. We dye to brown here at the boutique, so if the right shade of brown shoes is not in this selection, don't despair, as we will colour a pair at your request and to the exact shade that you want. 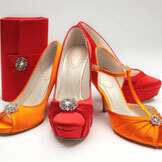 All that is needed is a swatch of material and for you to choose a pair of shoes from the extensive range of dyeable wedding shoes. Please follow the link from the foot of this page to access the dyeable range.